Bistite II SC is a self-etching, self-curing, all-purpose adhesive resin cement system. 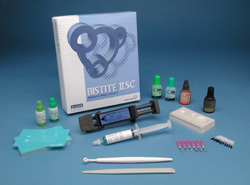 The main components of the Bistite II SC kit are the resin cement pastes contained in the super syringe and a series of primers used to enhance bonding to various substrates. Super Syringe allows easy handling by extruding base and catalyst equally at the same time. Bistite II SC is available in three radiopaque shades: Translucent (clear), Dentin (brown), Opaque (ivory).